All you need to know in one e-book! Flying a radio control helicopter is one of the most rewarding of all rc disciplines, there's no question about that! For the complete newbie, it's a minefield. The selection of helicopters available is simply overwhelming, and the information about them even more so. "The Beginner's Guide To Flying RC Helicopters" e-book, written by myself and rc heli guru John Salt (rchelicopterfun.com), breaks down all the barriers. It answers all the questions that the complete beginner to the hobby is likely to have, from understanding what a swashplate is to knowing how to perform that first aerobatic maneuver. In short, this e-book has been written from the ground up. It's a complete, no-nonsense resource that gets you flying an rc heli. And understanding them properly at the same time! If you're thinking about entering the exhilarating hobby of rc helicopter flying and need to know more, then look no further than this fully comprehensive e-book. Understanding RC systems & how they control the helicopter. Knowing which heli suits your needs. Helicopter controls and how they work. Preparing the helicopter for flight. Essential pre-flight checks you need to know. Complete flight school to get you airborne safely. Priced at just $17.00, this popular e-book represents excellent value and will give you a solid start in the hobby; the flight school section alone will save you time and money by teaching you how to fly as safely as possible. This 140 page easy-to-read guide can be purchased and downloaded in just a few clicks, by using any of the 'Buy Now' buttons throughout this page. "But what this hobby has seen in recent years is a complete change in variety and designs of helicopter available; electric power (EP) has become the norm and multi-function helicopters that need no assembly whatsoever and can pretty much be flown straight out the box are being sold in hobby and toy shops alongside model cars and boats - this was an unthinkable idea not that long ago. And even more recently, as the ongoing electronic revolution continues, we now have easy access to micro-size helicopters that sit comfortably in the palm of your hand and can be flown in a completely controlled manner around your living room..."
"It's important to realise, though, that such fixed pitch helicopters do have a steep learning curve and if you've never had any previous experience, say with flying a coaxial heli, then you're in for a difficult time! Even with coaxial experience under your hat, the flight characteristics and techniques needed to fly an FP heli are completely different and learning to co-ordinate main rotor and tail rotor well can be quite a game to begin with. Unlike a coaxial RC helicopter, a fixed pitch heli like those named above can't be flown straight out the box with no previous experience, despite what the manufacturers tell you!" "By the way, when talking about channels it's important to note that this word has two completely different meanings in the radio control hobby. The first is that outlined above, the frequency channel, while the other refers to how many controllable functions an RC model has. For example, a helicopter that has control to just motor power (main rotor speed) and tail rotor speed (yaw) is said to be 'two channel' while one with motor power, yaw and fore/aft and left/right cyclic control is four channel. A more complicated multi-channel CP helicopter will have motor power, cyclic, collective and yaw control as well as additional 'idle up' and remote gyro gain control - in this case it has six channels." "Less complex fixed pitch and coaxial helicopters usually have just two servos controlling fore/aft and left/right cyclic pitch, working independently of each other with no mixing of the two. This gives the (non-yaw) directional control to the helicopter, while the ESC controls the motor/rotor speed and hence the altitude control (remember, more power means faster spinning blades and hence more lift being generated, and vice versa). A final note to make about servos is that sooner or later you'll come across the terms digital servo and analogue servo being thrown around. We won't dive deep into this topic, as even most of the basic of RTF collective pitch helicopters come equipped with digital servos these days, but it's worth mentioning why..."
"As with collective pitch vs. main rotor speed for altitude control, so it's much better to have tail rotor pitch controlling the yaw rather than a separate motor controlling the speed of the tail rotor. In exactly the same way a fixed pitch heli is less responsive to climb/descent inputs so a heli with a motor-controlled tail rotor is less responsive to yaw inputs. In addition to that, electric RC helicopter tail motors are notoriously bad for burning out and having a very short life; having to replace the motor on a regular basis is bad enough, but having the motor die in mid-air and seeing your heli spin wildly out of control as you instantly lose all yaw control is sickening!" "The '400' size electric collective pitch helicopter is about the most popular size that beginners choose, notable examples are the E-flite Blade 400, Align T-Rex 450 and Thunder Tiger E325 helicopters. Such helis are very reasonably affordable yet offer all the flying capabilities you can expect from a truly aerobatic/3D radio control helicopter. And because of their popularity, replacement parts support is unmatched and there is a huge amount of information available on internet forums and websites about them - invaluable help to beginner and intermediate pilots alike." "If your helicopter doesn't have a flybar then checking the CG is a bit more involved. Some manufacturers might be kind enough to include a special 'Tee' fitting that attaches to the top of the main shaft and makes use of a spare flybar to balance the heli in the way described above. If no such fitting is included then an accepted method is to remove the whole rotor head assembly so that only the bare main shaft remains, and slide a length of suitably gauged wire through the hole that accepts the so-called Jesus Bolt (the bolt that secures the head assembly to the shaft). With the wire perpendicular to the tail boom, the heli can then be lifted upwards and balanced as per the above method." "As your confidence grows, which it will, you can increase power slightly and get the helicopter higher, up to two or three feet off the ground. For some helicopters, notably the smaller ones, this is actually very beneficial because it gets the model out of the Ground Effect ('GE') - this is the term used to describe the adverse effect on the helicopter by the very turbulent airflow around it; if a heli is hovering or flying very close to the ground then the downwash from the main rotor doesn't get cleared away, instead it bounces back off the ground and creates turbulence immediately around the helicopter. As a result the heli becomes even harder to control than it already is, hence climbing out of the GE is a good idea - but keeping your very first hops to a few inches off the ground is necessary from a safety point of view." "Well this lesson really sees the limit of learning basic fast forward flight; from here on in it really is a case of practice practice practice, and with time fast forward flight will become natural and easy. It will lead you on to fly more advanced aerobatic manoeuvres such as rolls and loops. Beyond that level lies the pinnacle of RC helicopter flying that is 3D. Now you've become comfortable with tail-in and side-on orientations, there's only one lesson remaining in this 'Flight School' section of the ebook, and that's learning how to fly in a nose-in orientation..."
As the above samples show, each page takes you step-by-step all the way. If you're thinking about getting in to the exciting and addictive hobby of flying helicopters, get your copy today and have all those questions answered! "I'd like to add my personal testimony about Pete's work; It's simply phenomenal! His way of explaining things are extremely easy to understand and I can truly say that his helicopter flying lessons gave the confidence I needed to fly the way I do it today. " "Well I just purchased your eBook "The Beginners Guide to R/C Helicopters" and for the price you ask I didn't expect all that much but bl**dy hell - I didn't expect THAT! 132 pages, well written and illustrated AND I can understand every word! Very well done - even an old fart like me should get his vintage nitro heli into the air!!" 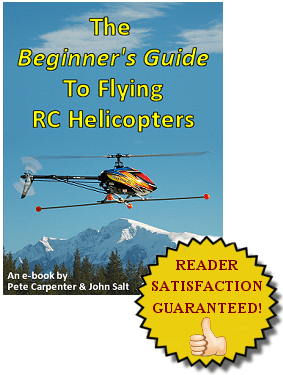 "Hi Pete....I can't say enough about what a great ebook your guide to RC helicopters is. It is written such that even someone with absolutely no previous knowledge of helicopters can understand what is going on. Thank you so much! " "From a Very Newbie-newbie. Thank you, thank you, thank you! WOW! finally someone that put all this heli-hell information into a comprehensive format. I enjoy flying/crashing ( not for long ) 120SR, mSRx and the mCPx with a DX6i tx. What a nightmare it was for me to find intelligent & concise information of this three dimensional hobby and all the in's and out's of this never ending learning curve. I LOVE IT. I went, head first, and plunging into the deep water's without learning to swim first. Thank goodness I can float. I purchased the beginners manual & the how to mSR/x and 120SR manual. This is the best upgrade I've incorporated in my heli collection. Mr. Carpenter & Mr. Salt have done what no one has been able to do; break it all down in a well rounded "level 1" manner and beyond. People may know many things but to teach it; is an art. And I don't care how many words a picture "says". BRAVO. I'm so happy/excited to learn proper habits / terminologies. Thumbs on the sticks with knowledge. Best regards from Vancouver B.C." "I just had to write to let you know I have just finished reading the Beginner's Guide e-book I bought from you recently and the hardest thing was putting it down unfinished! Fantastic - easy to follow for a newbie into heli's and so well laid out to get new pilots off the ground safely. Well done to you both! " "Thanks for the Beginners Guide To Flying RC Helicopters ebook. I can't think of a better written resource for people who are getting into this hobby/addiction. You guys nailed every important topic and cut to the chase in an easy readable format. I guess what I liked best about it is it's current! It seems most other RC helicopter books I have come across are somewhat outdated due to the fast paced changes this hobby is experiencing. Not the case with your ebook and I suspect because it is an ebook, it will be pretty easy to keep it up to date. Well done both!" "Most people are aware of RTF (Ready To Fly) & BNF (Bind And Fly), this book should now be considered RNF - Read And Fly! It makes bad purchases and choices so much easier to avoid and is written in a way that grips the reader without being so technical as to become boring. There is enough information but laid out in such a way as not to confuse or overload the new chopper pilot / owner. All round one of the best books I have on any subject. If you don't have it, get it - it's well worth it and will save its own cost in crash repairs very quickly!" "Pete, you and John have done a really great job with this book. I wish it had been published before I took up RC helis. I would have saved a lot of money and disappointment. Even after 5 months of flying I have learned much from it. Well written and well presented in layman's terms, this has to be the essential reading for anyone considering buying their first heli before they go out and buy it." 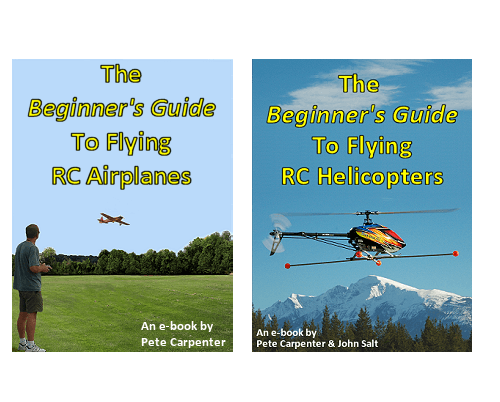 "Dear John & Pete, I recently purchased your Beginners RC Heli e-book. Great job! I honestly wasn't expecting too much, I've been disappointed by "how to" ebooks before, but this ebook is well written, covers way more material than I thought it would and it was fun to read. I'm still absorbing it all, but at least I now know what kind of helicopter I want (collective pitch). I decided to purchase your other 2 ebooks on heli setup and was equally impressed. I'm so excited about getting started, I feel like a kid again - thanks!" "I wanted to let you know how much I'm enjoying your Beginners Guide to Helicopters that I purchased a few days ago. You've cleared so much up for me in an understandable way. I purchased another RC Heli hard copy book at a hobby shop a couple weeks ago that was suppose to be for beginners, but it was focused on nitro power and didn't touch on electric power at all. I really want to get my first decent RC helicopter for Christmas and this guide is perfect for me." Important purchasing information - please read! "The Beginner's Guide To Flying RC Helicopters" is an e-book, it's not a hard copy book. In other words it's a PDF file that you download and save to your computer - please be clear on this before you buy it. When you buy the e-book, you will receive an e-mail from pete. carpenter 12 @ gmail . com (no spaces) which contains a link to the download page. Please add that e-mail address to any whitelisting feature you have enabled, to prevent it being filtered as spam, as sometimes the download link within the e-mail will trigger the filter. When you download the e-book, please save the file to your hard drive. If you simply open the file and start reading without saving it, you'll lose it when you close the file. If you want to know about learning to fly both types of radio controlled aircraft, you can purchase The Beginner's Guide To Flying RC Airplanes and The Beginner's Guide To Flying RC Helicopters e-books together and save some bucks. The cost for this deal is just $25.00, fantastic value for so much info! This link will get you the ebook combo deal. Both guides follow the same easy-reading format and style, and contain equal amounts of essential information to get you started safely in this exhilarating and very addictive hobby of radio control flying. 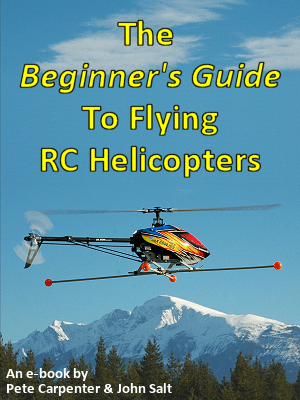 The Beginner's Guide To Flying RC Helicopters e-book is a very genuine and original resource for anyone looking at getting in to flying radio control helicopters. If, after you've read it, you're dissatisfied with the information contained within it please e-mail me and I will sort out a refund, this offer is valid for 60 days from the date of purchase. Please don't ask for a refund if you thought you were buying a hard copy book - I can't make it any clearer throughout this page that it's not a hard copy book! To buy The Beginner's Guide To Flying RC Helicopters right now, just use that link or any of the 'Buy Now' buttons on this page and download your e-book in just a few minutes. Ask me about The Beginner's Guide To Flying RC Helicopters, if you have questions about the e-book. Beginner's Guide planes & helis combo deal. Save money when you buy both of Pete's e-books together. You'll get both download links for the airplanes and helicopters guides. Pay just $25.00 for both e-books, ridiculous value for so much info! Purchase the combo deal here.